Sarawak (; [saˈrawaʔ]) is one of two Malaysian states on the island of Borneo. Located in northwest Borneo, Sarawak is bordered by the Malaysian state of Sabah to the northeast, Kalimantan, the Indonesian portion of Borneo, to the south, and the independent country of Brunei in the north. 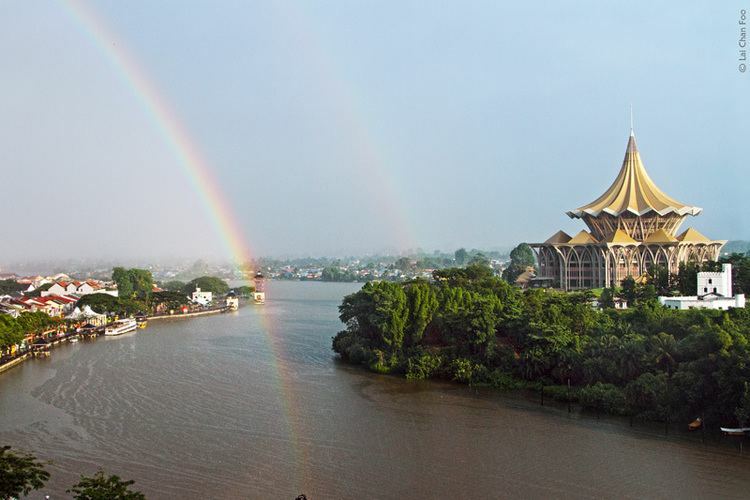 The capital city, Kuching, is the economic centre of the state and seat of the Sarawak state government. Other cities and towns in Sarawak include Miri, Sibu, and Bintulu. As of the 2015 census, the population of Sarawak was 2,636,000. 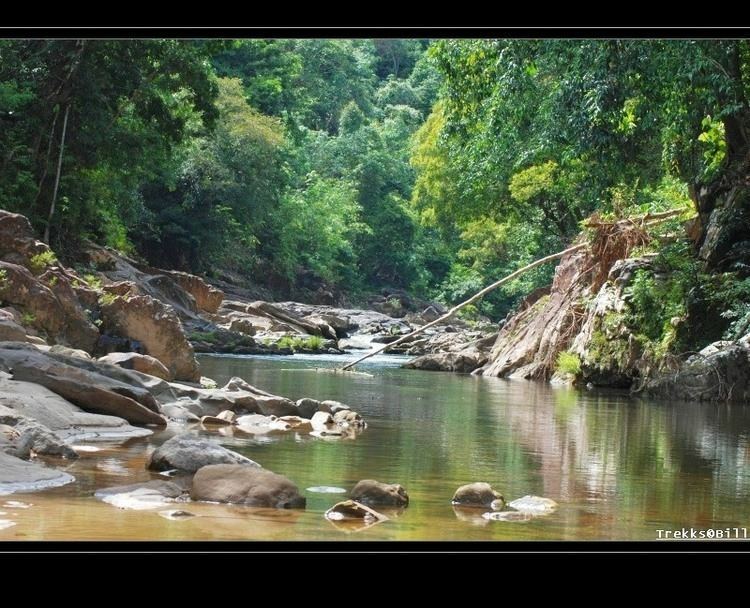 Sarawak has an equatorial climate with tropical rainforests and abundant animal and plant species. It has several prominent cave systems at Gunung Mulu National Park. Rajang River is the longest river in Malaysia; Bakun Dam, one of the largest dams in Southeast Asia, is located on one of its tributaries, the Balui River. Mount Murud is the highest point in Sarawak. The head of state is the Governor, also known as the Yang di-Pertua Negeri, while the head of government is the Chief Minister. Sarawak is divided into administrative divisions, and districts, governed by a system that is closely modelled on the Westminster parliamentary system and was the earliest state legislature system in Malaysia. The generally-accepted explanation of the state's name is that it is derived from the Sarawak Malay word serawak, which means antimony. A popular alternative explanation is that it is a contraction of the four Malay words purportedly uttered by Pangeran Muda Hashim (uncle to the Sultan of Brunei), "Saya serah pada awak" (I surrender it to you), when he gave Sarawak to James Brooke, an English explorer in 1841. James Brooke later became the first of the White Rajah dynasty to govern Sarawak. However, the latter explanation is incorrect: the territory had been named Sarawak before the arrival of James Brooke, and the word awak was not in the vocabulary of Sarawak Malay before the formation of Malaysia. The Bruneian Empire was established in the coastal regions of Sarawak by the mid-15th century, and the Kuching area was known to Portuguese cartographers during the 16th century as Cerava, one of the five great seaports of Borneo. By the early 19th century, the Bruneian Empire was in decline, retaining only a tenuous hold along the coastal regions of Sarawak which were otherwise controlled by semi-independent Malay leaders. Away from the coast, territorial wars were fought between the Iban and a Kenyah-Kayan alliance. Charles Anthoni Brooke succeeded his uncle in 1868 as the next White Rajah. Under his rule, Sarawak gained Limbang and the Baram and Trusan valleys from the Sultan of Brunei, later becoming a protectorate in 1888 with Britain handling foreign affairs but the Brooke government retaining administrative powers. Domestically, Brooke established the Sarawak Museum – the oldest museum in Borneo – in 1891, and brokered a peace in Marudi by ending inter-tribal wars there. Economic development continued, with oil wells drilling from 1910 and the Brooke Dockyard opening two years later. Anthony Brooke, who would become Rajah Muda (heir apparent) in 1939, was born in 1912. A centenary celebration of Brooke rule in Sarawak was held in 1941. During the celebration, a new constitution was introduced that would limit the power of the Rajah and granting the Sarawak people a greater role in the functioning of government. However, this constitution was never fully implemented due to the Japanese occupation. That same year saw the British withdrawing its air and marine forces defending Sarawak to Singapore. With Sarawak now unguarded, the Brooke regime adopted a scorched earth policy where oil installations in Miri were to be destroyed and the Kuching airfield held as long as possible before being destroyed. Nevertheless, a Japanese invasion force led by Kiyotake Kawaguchi landed in Miri on 16 December 1941 and conquered Kuching on 24 December 1941, with British ground forces retreating to Singkawang in neighbouring Dutch Borneo. After ten weeks of fighting there, the Allied forces surrendered on 1 April 1942. Charles Vyner Brooke, the last Rajah of Sarawak, had already left for Sydney, Australia; his officers were captured by the Japanese and interned at the Batu Lintang camp. Lacking the resources to rebuild Sarawak after the war, Charles Vyner Brooke decided to cede Sarawak as British Crown Colony and a Cession Bill was put forth in the Council Negri (now Sarawak State Legislative Assembly), which was debated for three days. The bill was passed on 17 May 1946 with a narrow majority (19 versus 16 votes). This caused hundreds of Malay civil servants to resign in protest, sparking an anti-cession movement and the assassination of the second colonial governor of Sarawak Sir Duncan Stewart. Despite the resistance, Sarawak became a British Crown colony on 1 July 1946. Anthony Brooke opposed the cession of Sarawak to the British Crown, for which he was banished from Sarawak by the colonial government. He was only allowed to return 17 years later after Sarawak had become part of Malaysia. In 1950 all anti-cession movements in Sarawak ceased after a clamp-down by the colonial government. On 27 May 1961, Tunku Abdul Rahman, the prime minister of the Federation of Malaya, announced a plan to form a greater federation together with Singapore, Sarawak, Sabah and Brunei, to be called Malaysia. On 17 January 1962, the Cobbold Commission was formed to gauge the support of Sarawak and Sabah for the plan; the Commission reported 80 percent support for federation. On 23 October 1962, five political parties in Sarawak formed a united front that supported the formation of Malaysia. Sarawak was officially granted self-government on 22 July 1963, and became federated with Malaya, North Borneo (now Sabah), and Singapore to form the federation of Malaysia on 16 September 1963.The governments of the Philippines and Indonesia opposed the federation, as did the Brunei People's Party and Sarawak-based communist groups, and in 1962, the Brunei Revolt broke out. Indonesian President Sukarno responded by deploying armed volunteers and, later, military forces into Sarawak. Thousands of Sarawak communist members went into Kalimantan, Indonesian Borneo, and underwent training with the Communist Party of Indonesia. The most significant engagement of the confrontation was fought at Plaman Mapu in April 1965. The defeat at Plaman Mapu ultimately resulted in the fall of Sukarno and he was replaced by Suharto as president of Indonesia. Negotiations were restarted between Malaysia and Indonesia and led to the end of the confrontation on 11 August 1966. A number of communist groups existed in Sarawak, the first of which, the Sarawak Overseas Chinese Democratic Youth League, formed in 1951. Another group, the North Kalimantan Communist Party (NKCP) (also known as Clandestine Communist Organisation (CCO) by government sources) was formally set up in 1970. Weng Min Chyuan and Bong Kee Chok were two of the more notable communist leaders involved in the insurgency. As the political scene changed, it grew progressively more difficult for the communists to operate. This led to Bong opening talks with chief minister Abdul Rahman Ya'kub in 1973 and eventually signing an agreement with the government. Weng, who had moved to China in the mid-1960s but nonetheless retained control of the CCO, pushed for a continued armed insurrection against the government in spite of this agreement. The conflict continued mostly in the Rajang Delta region but eventually ended when, on 17 October 1990, the NKCP signed a peace agreement with the Sarawak government. Major political parties in Sarawak can be divided into three categories: native non-Muslim, native Muslim, and non-native; parties, however, may also include members from more than one group. The first political party, the Sarawak United Peoples' Party (SUPP), was established in 1959, followed by the Parti Negara Sarawak (PANAS) in 1960 and the Sarawak National Party (SNAP) in 1961. Other major political parties such as Parti Pesaka Sarawak (PESAKA) appeared by 1962. These parties later joined the national coalition of the Alliance Party. The Alliance Party (later regrouped into Barisan Nasional) has ruled Sarawak since the formation of Malaysia. The opposition in Sarawak has consistently alleged that the ruling coalition uses various types of vote-buying tactics in order to win elections. Stephen Kalong Ningkan was the first Chief Minister of Sarawak from 1963 to 1966 following his landslide victory in local council elections. However, he was ousted in 1966 by Tawi Sli with the help of the Malaysian federal government, causing the 1966 Sarawak constitutional crisis. Since the 2006 state election, the Democractic Action Party (DAP) has derived the majority of its support from urban centres and became the largest opposition party in Sarawak. In 2010, it formed the Pakatan Rakyat coalition with Parti Keadilan Rakyat (PKR) and Parti Islam Se-Malaysia (PAS); the latter two parties had become active in Sarawak between 1996 and 2001. Sarawak is the only state in Malaysia where West Malaysia-based component parties in the BN coalition, especially the UMNO, have not been active in state politics. Unlike states in Peninsular Malaysia, Sarawak is divided into divisions, 12 in all, as well as districts, each headed by an appointed resident. The total land area of Sarawak is nearly 124,450 square kilometres (48,050 sq mi), making up 37.5 percent of the total area of Malaysia, and lies between the northern latitudes 0° 50′ and 5° and eastern longitudes 109° 36′ and 115° 40′ E. Its 750 kilometres (470 mi) of coastline is interrupted in the north by about 150 kilometres (93 mi) of Bruneian coast. Sarawak is separated from Kalimantan Borneo by ranges of high hills and mountains that are part of the central mountain range of Borneo. These become loftier to the north, and are highest near the source of the Baram River at the steep Mount Batu Lawi and Mount Mulu. Mount Murud is the highest point in Sarawak. Sarawak can be divided into two geological zones: the Sunda Shield, which extends southwest from the Batang Lupar River (near Sri Aman) and forms the southern tip of Sarawak, and the geosyncline region, which extends northeast to the Batang Lupar River, forming the central and northern regions of Sarawak. The oldest rock type in southern Sarawak is schist formed during the Carboniferous and Lower Permian times, while the youngest igneous rock in this region, andesite, can be found at Sematan. Geological formation of the central and northern regions started during the late Cretaceous period. Other types of stone that can be found in central and northern Sarawak are shale, sandstone, and chert. Significant quantities of Sarawak soil are lithosols, up to 60 percent, and podsols, around 12 percent, while abundant alluvial soil is found in coastal and riverine regions. 12 percent of Sarawak is covered with peat swamp forest. Historically, Sarawak's economy was stagnant during the rule of previous three white Rajahs. After the formation of Malaysia, Sarawak GDP growth rate has risen due to increase in petroleum output and the rise in global petroleum prices. However, the state economy is less diversified and still heavily dependent upon the export of primary commodities when compared to Malaysia overall. The per capita GDP in Sarawak was lower than the national average from 1970 to 1990. As of 2016, the urban-rural income gap remained a major problem in Sarawak. Tourism plays a major role in the economy of the state, contributing 9.3% of the state's GDP in 2015. Foreign visitors to Sarawak are predominantly from Brunei, Indonesia, the Philippines, Singapore, and China. A number of different organisations, both state and private, are involved in the promotion of tourism in Sarawak: the Sarawak Tourism Board is the state body responsible for tourism promotion in the state, various private tourism groups are united under the Sarawak Tourism Federation, and the Sarawak Convention Bureau is responsible for attracting conventions, conferences, and corporate events which are held in the Borneo Convention Centre in Kuching. The public and private bodies in Sarawak hold a biannual event to award the Sarawak Hornbill Tourism Award, an award for achievements within various categories, to recognise businesses and individuals for their efforts in the development of tourism within the state. The Melanau are a native people of Sarawak that lived in areas primarily around the modern city of Mukah, where they worked as fishermen and craftsmen as well renowned boat-builders. Historically the Melanau practised Animism, a belief that spirits inhabited objects in their environment, and while this is still practised today, most Melanau have since been converted to Christianity and Islam. 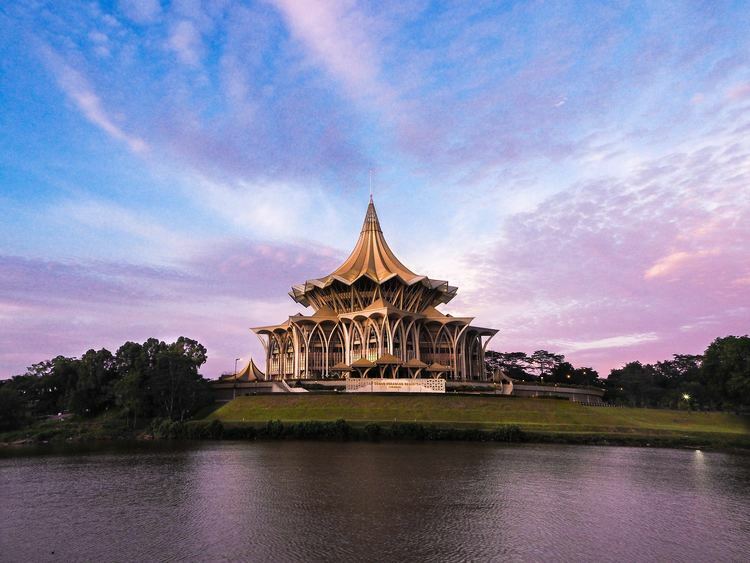 Although Islam is the official religion of the federation, Sarawak has no official state religion. However, during the chieftainship of Abdul Rahman Ya'kub, the Constitution of Sarawak was amended to make the Yang di-Pertuan Agong as the head of Islam in Sarawak and empower the state assembly to pass laws regarding Islamic affairs. With such provisions, Islamic policies can be formulated in Sarawak and the establishment of Islamic state agencies is possible. The 1978 Majlis Islam Bill enabled the setting up of Syariah Courts in Sarawak with jurisdictions over matrimonial, child custody, betrothal, inheritance, and criminal cases in the state. An appeals court and Courts of Kadi were also formed. Sarawak is the only state in Malaysia where Christians outnumber Muslims. The earliest Christian missionaries in Sarawak were Church of England (Anglicans) in 1848, followed by Roman Catholics a few years later, and Methodists in 1903. Evangelizing first took place among the Chinese immigrants before spreading to indigenous animists. Other Christian denominations in Sarawak are Borneo Evangelical Mission (or Sidang Injil Borneo), and Baptists. Indigenous people such as the Iban, Bidayuh, and Orang Ulu have adopted Christianity although they do retain some of their traditional religious rites. Many Muslims come from the Malay, Melanau, and Kayan ethnic groups. Buddhism, Taoism, and Chinese folk religion are predominantly practised by Chinese Malaysians. Other minor religions in Sarawak are Baha'i, Hinduism, Sikhism, and animism. English was the official language of Sarawak from 1963 to 1974 due to opposition from First Chief Minister of Sarawak Stephen Kalong Ningkan to the use of the Malay language in Sarawak. In 1974 the new Chief Minister Abdul Rahman Ya'kub recognised Malay alongside English as an official language of Sarawak. This new status given to the Malay language was further reinforced by new education standards transitioning curriculum to Malay. In 1985 English lost the status of an official language, leaving only Malay. Despite official policy, Sarawak opposition members argue that English remained the de facto official language of Sarawak. English is still spoken in the legal courts, and state legislative assembly. In 2015, Chief Minister Adenan Satem announced that English will be reinstated as an official language. Although the official Malay dialect of Bahasa Malaysia is spoken by the government administration, it is used infrequently in colloquial conversation. The local dialect of Bahasa Sarawak (Sarawak Malay) dominates the vernacular. Bahasa Sarawak is the most common language of Sarawak Malays and other indigenous tribes. The Iban language, which has minor regional variations, is the most widely spoken native language, with 34 percent of the Sarawak population speaking it as a first language. The Bidayuh language, with six major dialects, is spoken by 10 percent of the population. The Orang Ulu have about 30 different language dialects. While the ethnic Chinese originate from a variety of backgrounds and speak many different dialects such as Hokkien, Hakka, Fuzhou, and Teochew, they also converse in Standard Chinese. The indigenous tribes of Sarawak traditionally used oratory to pass on their culture from one generation to the next; examples of these traditional practices include the Iban's Ngajat dances, Renong (Iban vocal repertory), Ensera (Iban oral narratives), and epic storytelling by the Kayan and Kenyah. In the years before federation, the colonial government recognised that British education and indigenous culture was influencing a new generation of Iban teachers. Thus, on 15 September 1958, the Borneo Literature Bureau was inaugurated with a charter to nurture and encourage local literature while also supporting the government in its release of documentation, particularly in technical and instructional manuscripts that were to be distributed to the indigenous peoples of Sarawak and Sabah. As well as indigenous languages, documents would also be published in English, Chinese and Malay. In 1977, the bureau came under the authority of the federal government language planning and development agency, the Dewan Bahasa dan Pustaka (DBP), which advocated publication only in Malay ultimately causing the demise of fledgling indigenous literature. It was a number of decades before print media began to appear in Sarawak. The Sarawak Gazette, published by the Brooke government, recorded a variety of news relating to economics, agriculture, anthropology, archaeology, began circulation in 1870 and continues in modern times. However, in the decades following federation, restrictive laws and connections to businesses have meant that the media is a largely state-owned enterprise. One of the earliest known text publications in Borneo, Hikayat Panglima Nikosa (Story of Nikosa the Warrior), was first printed in Kuching, 1876.
Notable dishes in the state include Sarawak laksa, kolo mee, and ayam pansuh. The state is also known for its Sarawak layer cake dessert.